Have you always wanted the Three Musketeers, but without D’Artangan and with more magic and assassins? Then the Greatcoats are your boys. Falcio and his two best friends are loyal to a dead king, just trying to keep their heads above water long enough to gain some semblance of security. Of course, this goes poorly for them, and from the very first chapter we’re tossed into a maelstrom of sword fights, double-crosses, and callbacks to people in Falcio’s past. Overall, the book was rollicking good fun. My only quibble is more personal preference than flaw: I felt like our heroes suffered a bit from what I call the “Arrow approach to minions”. In the eponymous TV series, the superhero Arrow kills evildoers and minions with nary a second thought, and sometimes without checking to be sure that they are, in fact, evildoers and minions. The Greatcoats don’t seem to be much concerned with whether lethal force is necessary–they just use it. It struck me as a little weird, given that Greatcoats are supposed to be legal officials, but then again they’re adjudicating in the middle of what is essentially the 100 Years’ War. It makes sense that they might be a little more inclined to dole out executions. Falcio has a strong moral code and frets about the ethics of a lot of his decisions–it would just have been nice to hear him reason, at least once, about why it’s cool to fling minons off a roof. But I will say, the sword geek in me was happy to see such meticulous attention to detail in the fencing and weaponry, and I’m always a sucker for a crew that banters while they fight. 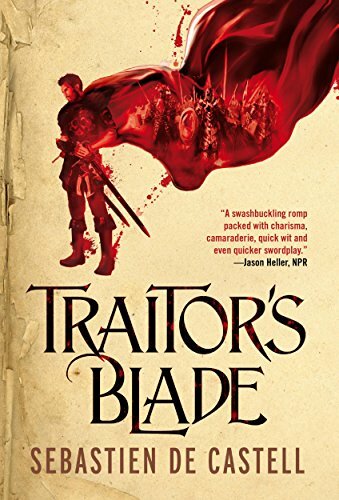 Basically, if you like swashbuckling and shenanigans, this is a great book for you to take a chance on. I’ll be reading the rest of the series.